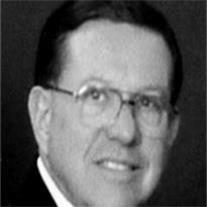 H. Bruce Gunnell, 64, passed away February 21, 2010 from cancer. He was born February 5, 1946 in Phoenix, AZ and was a 1964 graduate of Mesa High. He attended BYU and ASU and served an LDS mission in Argentina, followed by a lifetime of service in the church. He owned Scottsdale Big O Tires and later Blinds by Bruce. He was a loving husband, father and papa. He is survived by his wife of 38 years, Sally and children Michael, Natalie (Martinez), Glen, Becky (Wilcken), 15 grandchildren, and siblings Joyce, Arlene, and Gary. The viewing is Thursday, Feb. 25 from 6-8 PM at Bunker’s Garden Chapel, 33 N. Centennial Way in Mesa. Funeral services are Friday, Feb. 26 at 10 AM preceded by a viewing at 9 AM at the LDS Mesa North Stake Center, 933 E. Brown Rd. Donations may be made to the LDS General Mission fund or Hospice of the Valley.